I dithered and dallied all morning in Tan Hill, I had a late breakfast at 09:15 and then lazed in my room until 10:30 when I moved to the lounge and sat drinking Coke in the comfy chairs. By 11:15 I figured I’d killed enough time, so I set out into a dank and soggy morning. I’d been watching the weather deteriorate from 08:00 when it had looked quite bright, to become foggy, then rainy, and finally it settled on just plain windy as hell. I’d heard the wind in the night, trying to lift the roof of the building, so I was pleasantly surprised to be able to stand up in it as I stepped out of the door of the pub and set out over the sheep swallowing bog fest that is Sleightholme Moor. Praise Be! It was at my back too! 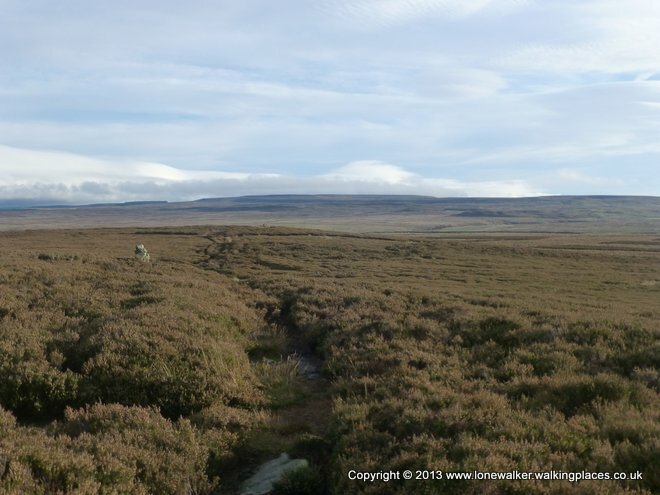 The first couple of miles from Tan Hill are downhill, which makes a nice change, and although the moor was incredibly sodden and squishy, it wasn’t as bad as I’d expected. I’d even considered walking along the road and cutting in later on the 4wd drive track that meets Frumming Beck at the big bridge. But I’d been contracted to walk the Pennine Way, the whole Pennine Way and nothing but the Pennine Way, so walk it I was determined to do, taking the good with the bad. I’m glad I did too, because despite having to jump over boggy bits, the path is surprisingly enjoyable. The feeling of remoteness is incredible, as you leave Tan Hill and begin to drop down, you get an incredible view across what seems like miles and miles of desolate moorland to the busy traffic on the A66 in the distance. In between is nothing. A few white topped poles can be seen marching off into the desolate interior and the odd lost sheep, and you know you’re not going to see another soul for ages. Wonderful. 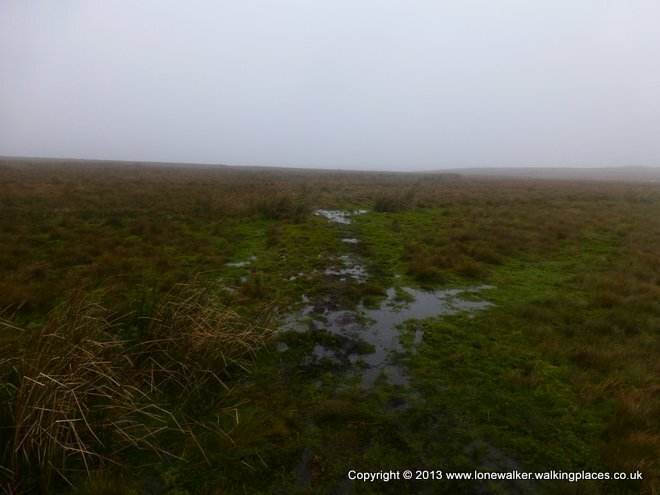 Sleightholme Moor – not for the faint-hearted – it’s desolate out here! As I progressed across the moor the sky ahead began to clear and I could see blue gaps in the white clouds. Behind me was another story however, a sheet of cloud and fog was rolling in behind me and I half expected to be caught at any moment, but it seemed to veer off eastwards and never got close enough to affect me. The wind was still strong and still behind me, so I made easy progress beside Frumming Beck and up to the good track that leads to Sleightholme Farm. It was a relief to feel solid ground under my feet again, my boots were already completely soaked of course and my Sealskins had given up the ghost too, so my liner socks were sodden. My feet become sore when I walk too far in wet boots, and I could feel my toes beginning to protest. I stopped and relaced my boots and that helped. Beyond the farm I lost the tarmac and squelched off across fields to find Intake Bridge. I’d gone wrong here last time I walked the Way and I made a point of paying close attention to the map. By doing so I could see how I’d gone wrong. The map in the guide book is misleading and I made some notes on how to improve it. I kept the right line this time and was soon at the decision point where Pennine Way walkers need to choose between Bowes and Baldersdale. I was bound for the latter, so another couple of miles across soggy fields and rough pasture were called for. I found a lonely spot with good visibility in both directions and applied some anti-chafing gel to the place that always seems to suffer when I walk for more than a couple of days at a time. I passed God’s Bridge (one of the many in England) and puffed slowly up the hill beyond to meet the A66. It was noisy and very busy and without the underpass you’d wait a long time to cross here. The next section, up to Ravock was my favourite of the day. It’s completely sodden and squelchy of course, but the path cuts through the heather and the views ahead are grand. The noise of the A66 was drowned out by the wind and the flapping of my coat hood. I dodged and jumped and hopped across boggier and boggier terrain, not so much to keep my feet dry, that was a cause I’d lost 10 minutes out of the pub, but to avoid sinking nuts deep in a peat hole. I didn’t fancy having to call someone to rescue me from a bog. I took shelter from the wind in the shooting hut beside Deepdale Beck at the foot of Cotherstone Moor. It has a small room at the end that isn’t locked up like the rest of the building and a little sign says ‘shelter’ on the door. I only had 2 miles go, 1 up to the summit of the moor and 1 down the other side. I decided to relax until about 3pm,so as to arrive at my B&B for about 4pm. Those final two miles were done in thick mist and with the worst underfoot conditions of the day; endless watery bog, but I still managed to avoid going in over my boots. Somehow I lost the line of the Pennine Way and found myself on a parallel track which brought me out to the road about 300 yards east of where I should have been. Not a huge problem, but even with a GPS it’s easy to go wrong. Without anything to navigate by it could end up being a serious problem. Chris, the owner of the B&B, has opened specially for me. He would normally be closed now, his last walker came through 3 weeks ago and he wasn’t expecting anyone else. He called me “odd” for walking at this time of the year. We had a good chat and I’ve just eaten one of my ready meals that I use when I go backpacking; he would have made an evening meal, but it’s not cheap and I don’t suppose he’d be too chuffed at the extra effort involved, so it just seemed easier. I saw no one today, except a farmer on a quad bike in the distance. I saw some footprints that had obviously been made earlier in the day and found a dog lead, but I never saw the owners of either. 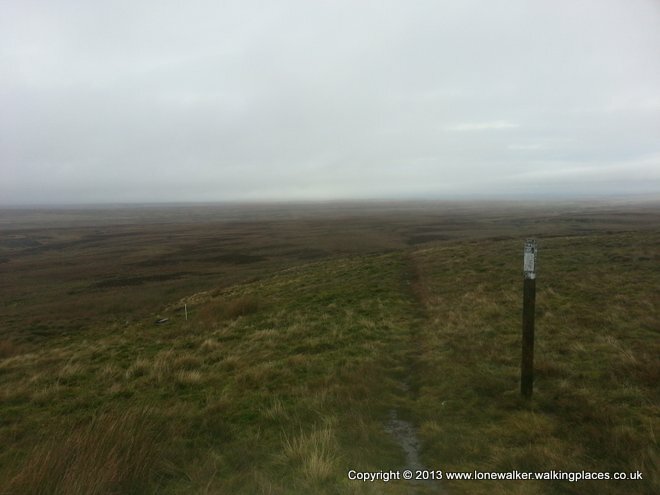 The Pennine Way isn’t a busy path in the height of the season, it’s deadly quiet in the winter it seems. Clove Lodge is up for sale, he’s had three offers fall through recently and two of those were not planning on keeping the B&B business open. 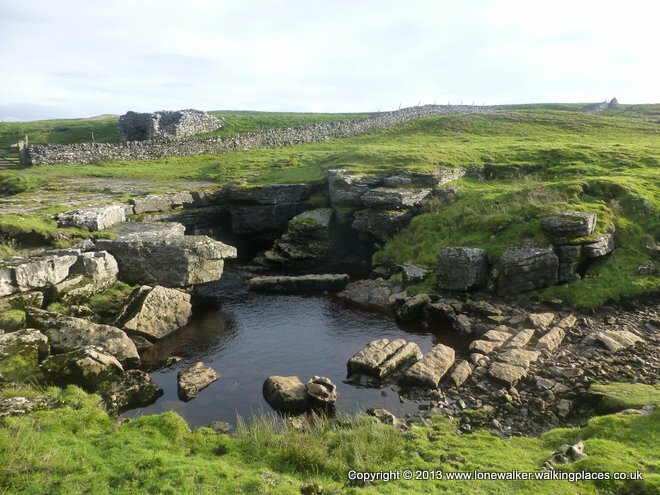 So there could soon be a hole in the Pennine Way accommodation around here. The nearby hostel is no longer a YHA hostel and only takes block bookings. The Ancient Unicorn in Bowes is on its last legs apparently and may not be going for much longer, at which point people will have to make the 17 mile journey from Tan Hill Inn to Middleton, or even worse, the 21 mile journey from Keld. Signing off for tonight, more tomorrow. The signal here is dead ropey, so this may not get posted until the morning. Clove Lodge is now closed for B&B accommodation and the Ancient Unicorn in Bowes is also closed. The Bowes Loop is now completely pointless are there is no accommodation, no camping, no shop, no pub, no nothing! 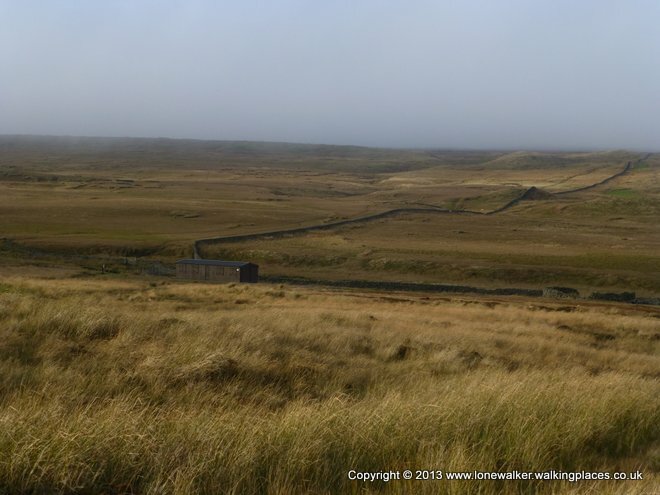 The stretch between Tan Hill and Middleton is a wilderness in terms of overnight shelter, unless you wildcamp. Great News! The Ancient Unicorn in Bowes is open again. They have just undergone a complete refurbishment and now have 12 B&B rooms, an all day coffee shop and bar meals! This is a huge boon for the Pennine Way in this area and I wish Andy the best of luck. You can contact them via email (theancientunicorn at gmail.com) or telephone (01833 628576). A challenging section in the summer season, but at this time of year an altogether different experience. Good to hear of the future map improvements beyond Intake Bridge, I carried on merrily along Sleightholme Beck and not liking to turn back had a steep climb up to Trough Heads Farm to re-join the path. It would be a sad day to loose Clove Farm; Chris provided a superb evening meal and breakfast for me and five other walkers last year, all on a day he had to take his wife into hospital. Looking forward to more posts – well done Stuart. For someone with wet feet you sure sound upbeat. This is a particularly atmospheric bit of the walk as I recall so perhaps that explains your exemplary positive attitude — despite the wet feet and bog jumping. Bit disconcerting to read the already limited accommodation options are under threat. For those doing the Bowes Loop, the Ancient Unicorn does fine meals in addition to offering pretty good rooms. Here’s hoping for a reprieve….